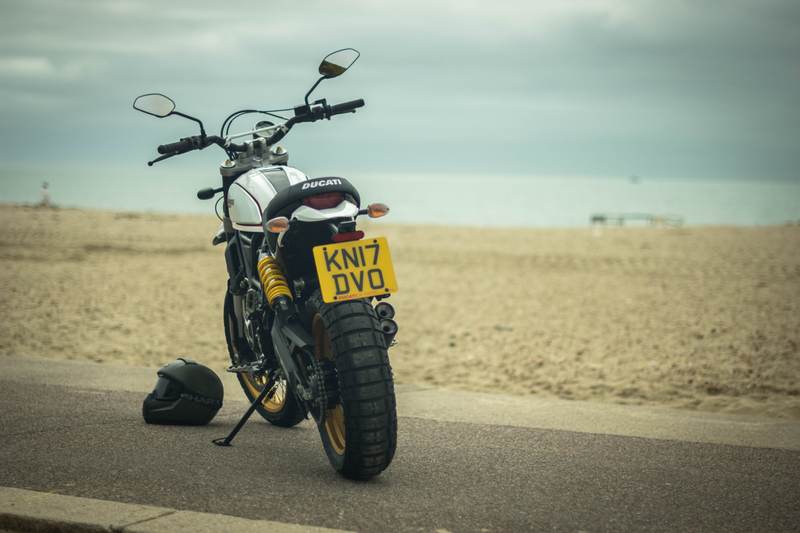 The retro bike renaissance is in full swing, with big name manufacturers like Honda, Yamaha and Triumph currently capitalising on our insatiable appetite for anything with a hint of vintage cool. Think it’s a bit passé? Blame the oppressive nature of hermetically sealed hi-tech, created by white-coated lab-technicians that have about as much personality as a USB stick. 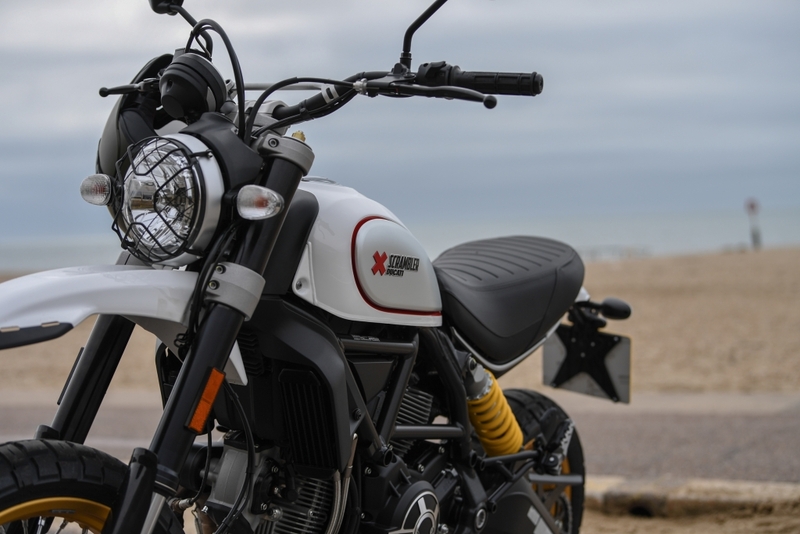 Bikers are clearly craving something that oozes period cool and the Ducati Scrambler series hit the proverbial nail on the head when it launched the sub-brand back in 2014. Perhaps unsurprisingly, the range of throwback soft-roaders now makes up a large chunk of all Ducatis shifted globally. 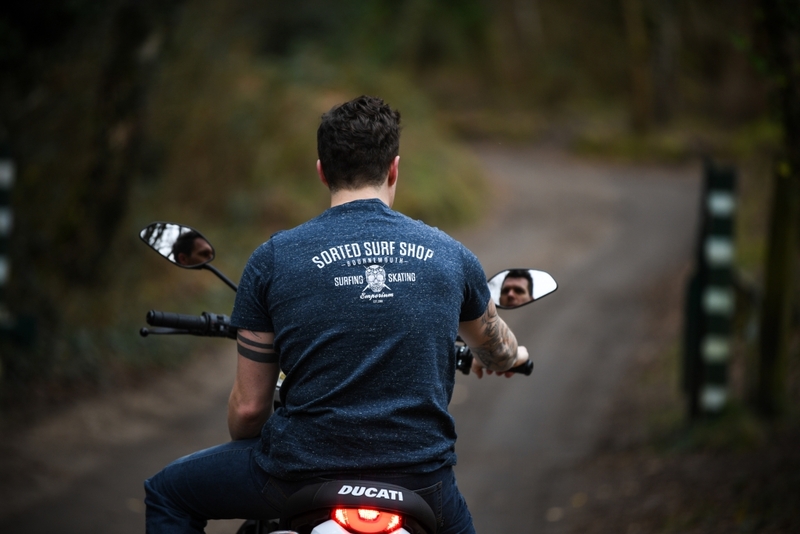 However, the Italian marque revealed two new models at the end of last year: the Desert Sled and the Café Racer. 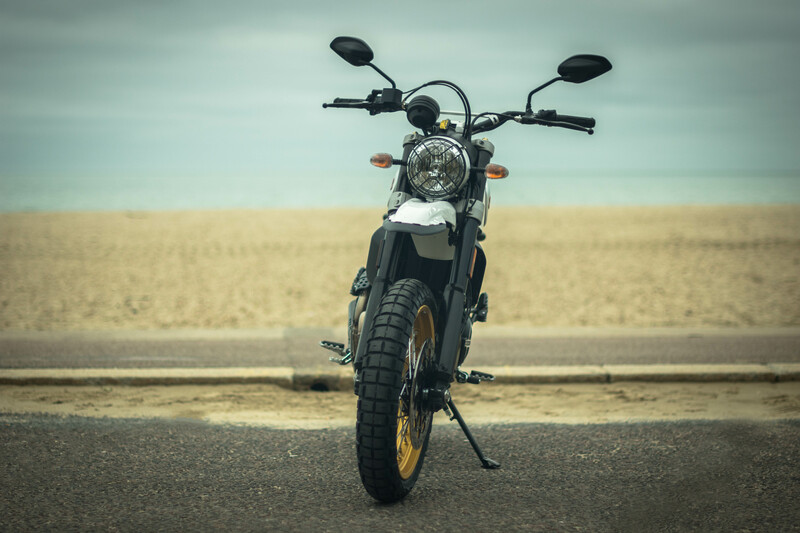 A quick flick through Instagram will reveal why it chose to mimic the rides of the Ton Up Boys, but the decision to design, engineer and produce a full-fat, mud-plugging Scrambler is a little more perplexing. And it is why we instantly fell in love the thing. 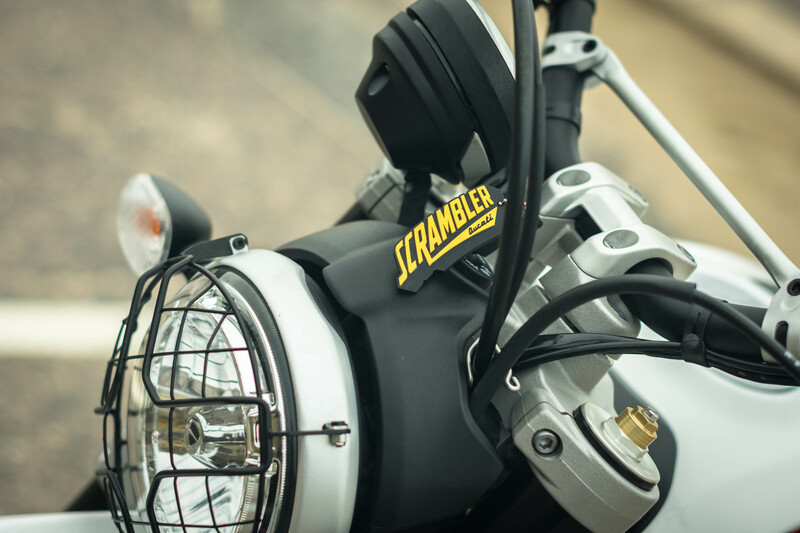 Based on (and named after) the motorcycles that riders would modify for use in the Californian desert during the 1960s and 70s, the Desert Sled goes far beyond the original Scrambler remit. 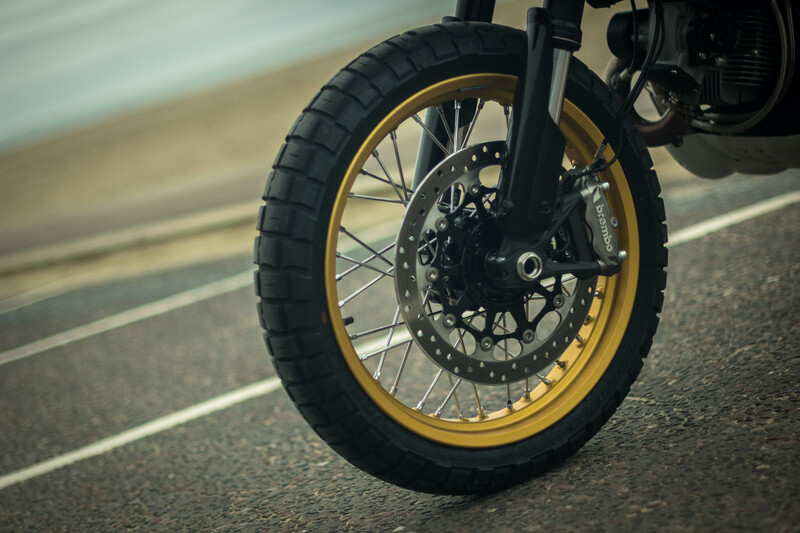 The beefed-up rims – decked out in an excellent gold hue on our test bike – the fully adjustable suspension, a raised seating position and a reinforced frame are all good indicators of its sand-railing intentions, yet it manages to remain undeniably stylish on the road. 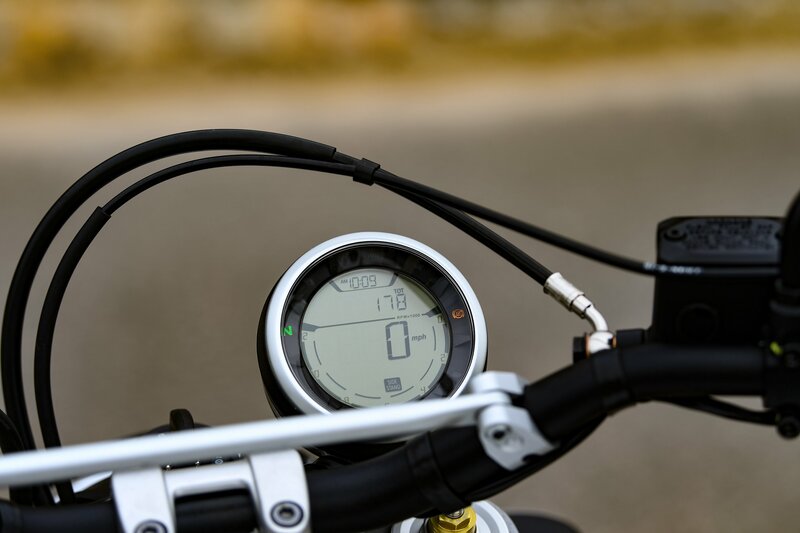 Twist the brilliantly simple key in the ignition and the equally basic digital clock comes to life. Thumb the ignition switch and 803cc V-twin motor fires after a couple of turns of the starter motor and settles into a typically lumpy Ducati idle. 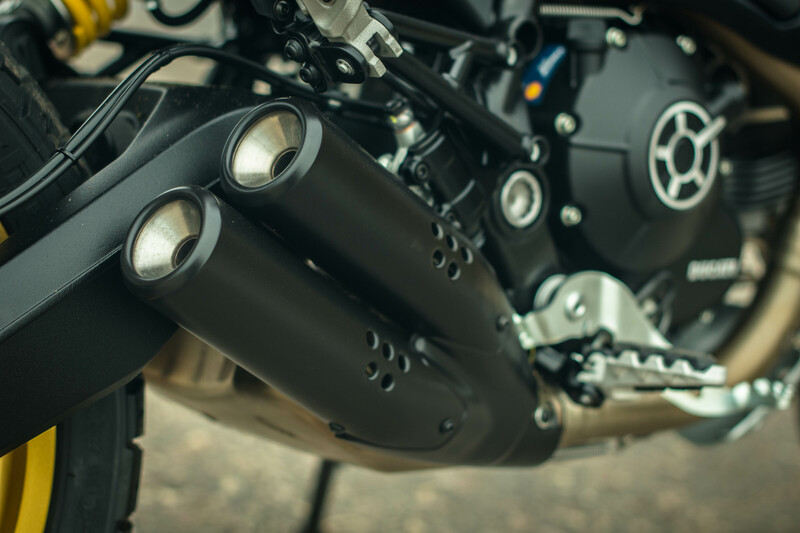 The soundtrack isn’t exactly scintillating, but wind on the throttle and the throbbing noise emanating from the Termignoni pipes becomes more engaging – although we wouldn’t blame owners for swapping the pipes out for something a little less, ahem, sensible. 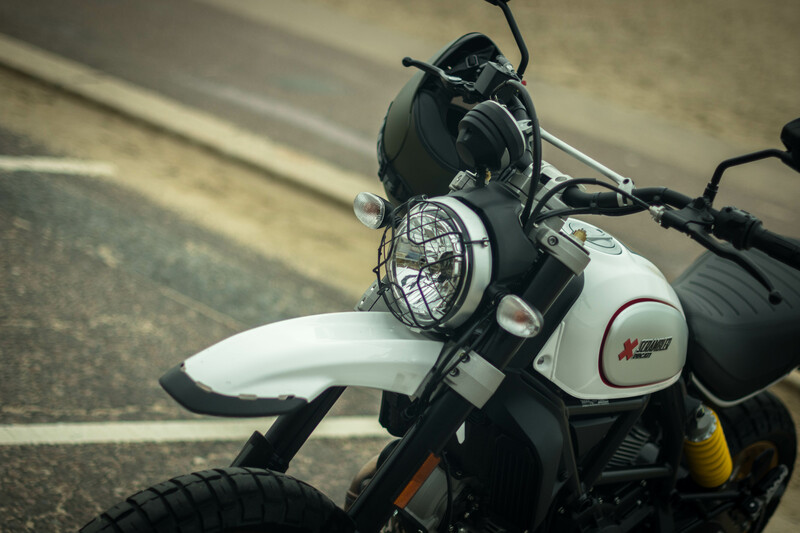 Power delivery is smooth and the Desert Sled feels perfectly at home in the stop/start traffic of our early test route. 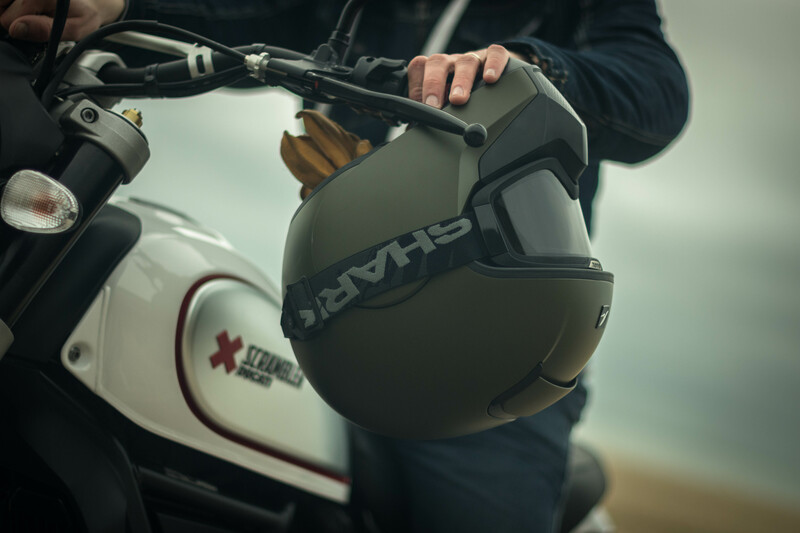 The upright seating position gives a commanding view of the road ahead; while the extra-wide bars make the bike extremely easy to throw around, yet they don’t encroach on the filtering experience. 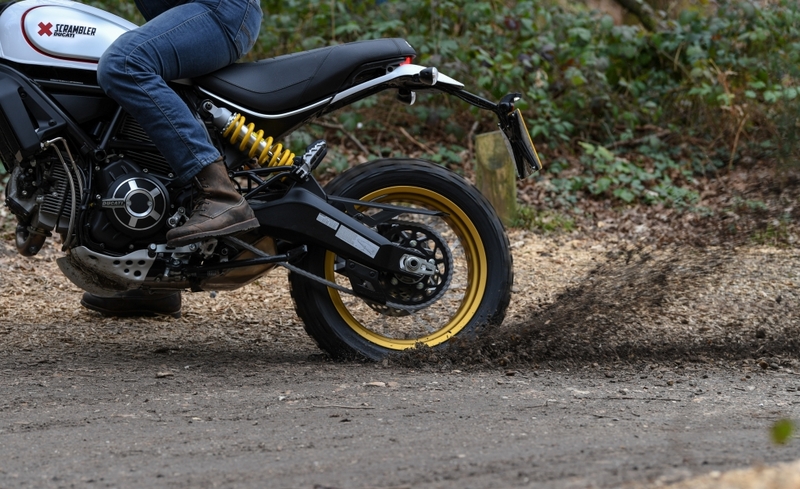 Plus, that dollop of low-down torque makes nipping in and out of traffic a doddle. 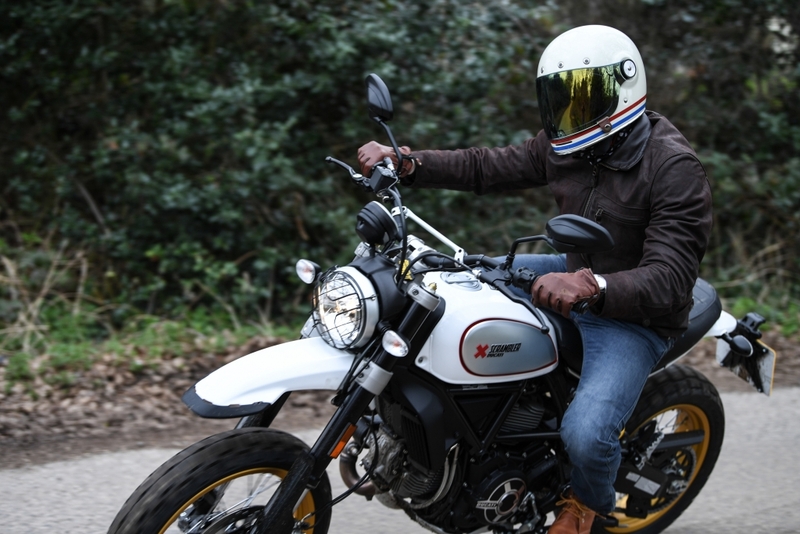 Of course, that open-chested riding position does leave commuters a little exposed to the elements on the motorway and although the engine is happy cruising at 80mph, it does feel a bit choppy perched up there. But that’s not really the Desert Sled’s remit. 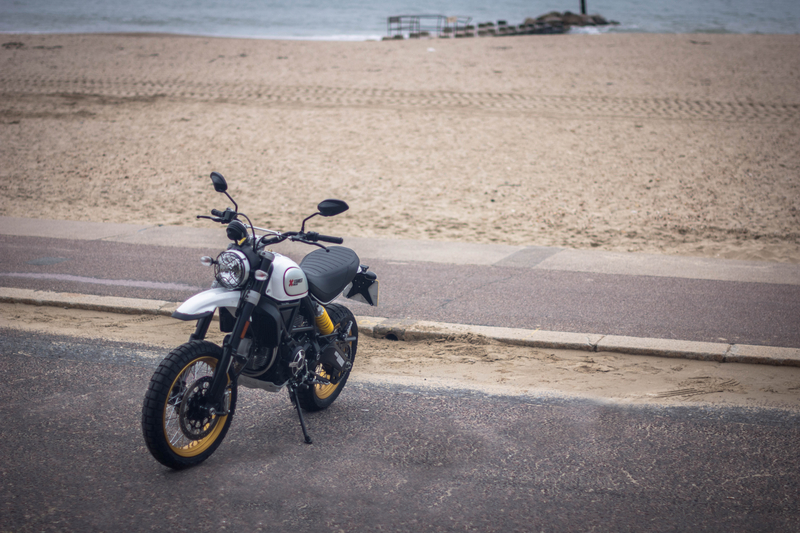 This isn’t an emotionally bereft daily workhorse; it’s a characterful urban ride that just begs to be taken the long way to work. Embrace your inner McQueen (you can keep your shirt on), hit the loose surfaces and it becomes quite clear that the Sled doesn’t mind mixing it up with the rough stuff. The 46mm fully adjustable USD front forks give plenty of ground clearance, while the Kayaba rear shock does a good job of keeping spines intact when the terrain gets ragged. 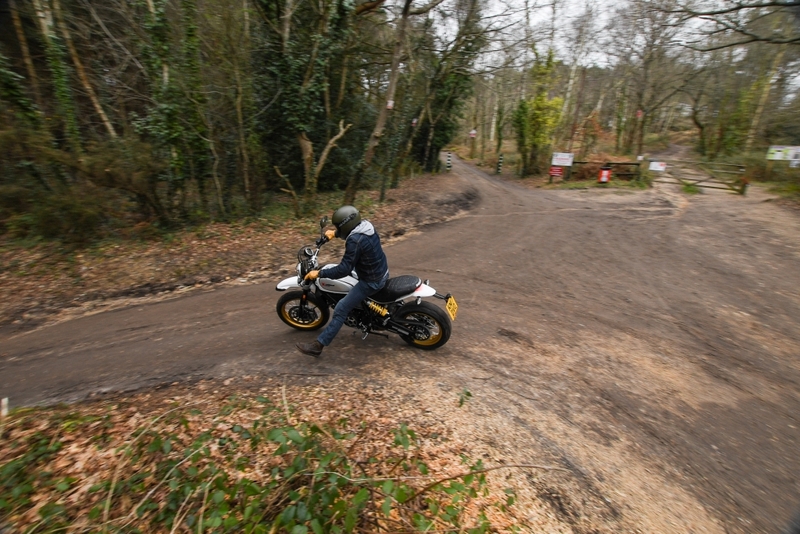 Ducati has sensibly fitted this bike with Pirelli Scorpion Rally STR tyres, which feel grippy enough on the wet mud surfaces of some back routes we found, yet inspire plenty of confidence on the road. Stopping power is provided by a meaty set of Brembo brakes and there’s an ABS system that kicks in if things get a little wayward. Back road to B-road,the Sled pretty much has it covered. And that’s a transition riders will often find themselves dealing with. 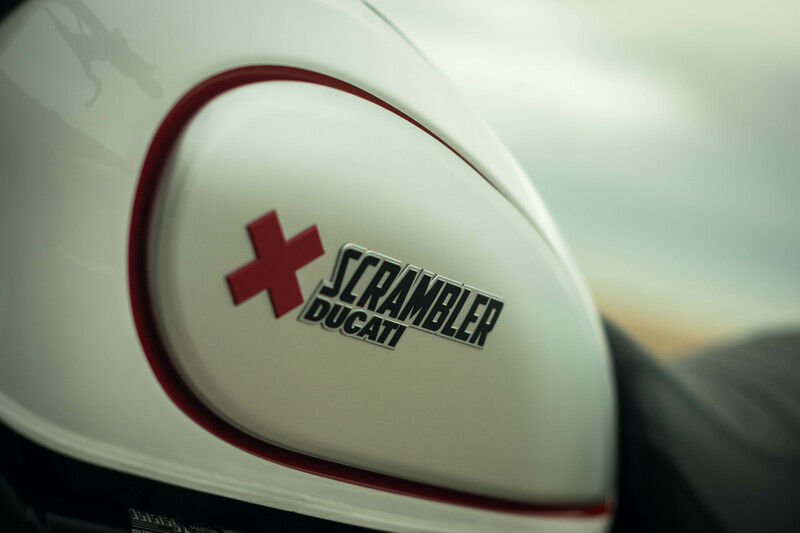 Get a few dirt splatters on the White Mirage paint job and the Ducati really comes to life. It’s the sort of bike that starts conversations: What is it? Where have you been? Why are you covered in mud? 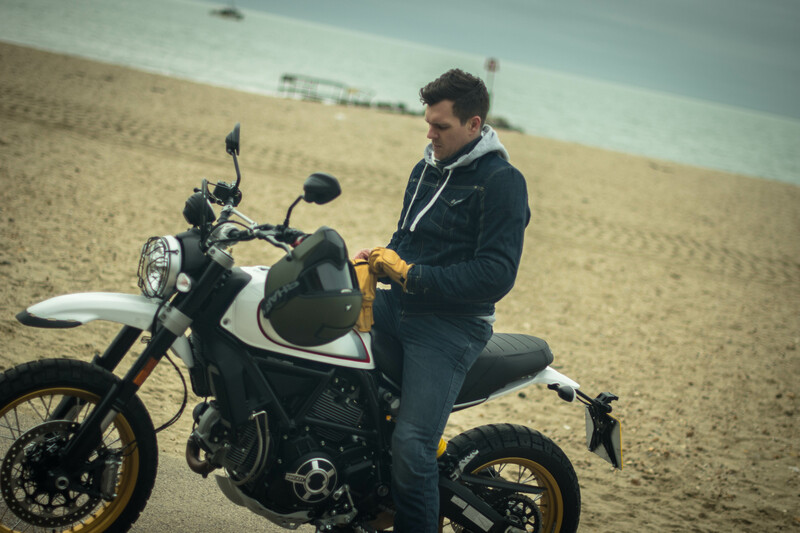 Naturally, the £9,495 asking price will make some wince, but the Ducati Scrambler Desert Sled is a lot more than a styling exercise. It’s a truly capable off-road machine that’s just as happy on the trails as it is cruising around town on a hot summer’s day. It’s achingly cool, surprisingly easy to live with and intoxicatingly fun. 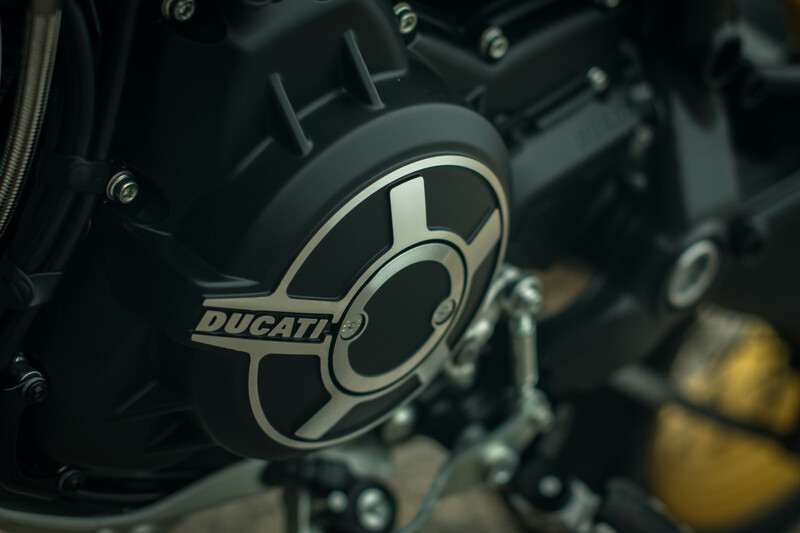 Ducati has successfully distilled the free spirit of the Swinging Sixties into a modern two-wheeled machine and for that, they should be applauded.